It has been said here that human beings reach mastery, nothing makes them unhappy.It has also been said that thee is a great secret that allows Masters to be in this place. I have already told you this secret, but did not identify it as "secret'. And so you do not have understood that this insight was the key to everything. Here is the key again.Here is the secret - Disunity doesnot exist. We are all one. This insight can change your experience of life. Neale Donald Walsch in Communion with God. WHAT IS HAPPENING IN THE SKIES? We are going to witness an exciting New Moon Opportunity on 17th/18th Dec 2017, when Five planets viz, Sun, Moon, Venus, Mercury and Saturn, ALL will be placed in close proximity of eight degrees on the Sign of Sagittarius AND Sun will be close to the Galactic Centre! All those people who have any planet in Sagittarius and specially those people who have Sun in Sagittarius and Specially those people who have Sun in Sagittarius in 9th House, get ready for a BIG inner connection to your Higher Wisdom to be revealed and activated! When Saturn is placed in conjunction to the New Moon point, all the ideas and all other relations which cover your inner connection with the Divine will fall away! When Mercury is retro, the noise of logical thinking is not there, and One can connect with the deeper emotional layers and FEEL the inner space of Divine! When The New Moon point is in close conjunction with the Galactic Centre, We can expect a BIG REVELATION from Higher Dimensions which clears the air of all misunderstanding, lies will be called lies and people will have a clear sense of Where We were misdirected! I am myself a Saturn 10th houser! And this placement is a REAL tough one, I have been changing my jobs life long. Till date I have been through 9 different jobs. On top of Saturn in 10th house, my saturn is in Capricorn. 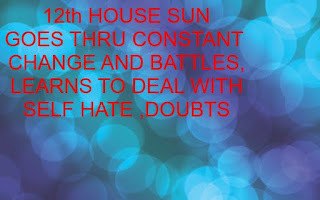 As if this was not good enough, Lord cursed/blessed me with an Opposing Moon in Cancer in 4th house! When I was young, any job seemed like a Prison to me. Because I wanted freedom more than Job, I am Sag Sun, and a 9th houser Sun! During my First Saturn Return, I left a good paying job in Dubai and settled for less paying Business in India, as I was more than happy as I had Some Freedom and did not report to any BOSS! NOW, I am into 2nd Saturn Return, and I am pursuing Two careers simultaneously. My present careers are 8th and 10th ones. One is a Retail Optical Shop Manager and Second is Financial Advisor. I have observed from looking at charts of people who have Saturn in 10th house in any sign, they will face tough challenges at their work place at least upto First Satur Return, which is from age 28 to 30. And some other placements like Saturn in exaltation people will face tough job conditions at least until Second Saturn Return which is from age 56 to 58. And I can never understand them well. From the available little data that I could get for birth details of Mr Sonam Wangchuk, I have prepared the chart (below). For those of you who are not aware of credentials of this extraordinary individual, HE is born in a remote mountain region of India, which is Ladakh one of most northern most parts of India. Born on 01 Sept 1966 in Leh district, he comes from a very poor family and He has made a name for himself with an institution known as SECMOL. To his credit, there are a number of other innovations, the most famous being preservation of water in mountainours regions by a new concept called ICE STUPA. A famous Hindi film "THREE IDIOTS" has been inspired by real life of Mr Sonam Wangchuk. Another notable placement is conjunction of Saturn and Moon in the watery sign of Pisces, elevating his consciousness where he sees needs and problems of people as his own. It is a pleasure to make charts of people like You Mr Sonam and Your presence on this time on earth is a blessings to humanity! I had a dream last night. The dream lasted several hours and left vivid memory of what I saw, which does not happen every time I have a dream. The dream was about the ongoing Sun, Moon, Mercury and Uranus conjuction in the sign Aries. I saw that Universe has released a new frequency of energy download in the skies which enables the humans to experience some kind of freedom. It was like a new version of software being released by Uranus to the collective consciousness of humanity. I have a gut feeling that each and every human being will experience freedom in his/her life depending upon placement of Uranus in his/her natal chart. While I was thinking of writing this post and mentally going through how every one will be affected individually and whether all will be affected in a positive way, I came across a small incident that gave me confidence to put down my dream sequence on a paper and post it on my blog. I was having cane juice at a wayside stall. The stall was being managed by an eledrly couple and their boy child aged about 12 yrs. And another baby child of the couple aged about four years was playing nearby. The elder son whose age was around 12 years had tied the hand of his younger sister aged 4 years with the help of a thin rope to a chair. Having tied her hand to the chair, he walked away and attended to his chore of attending the customers, thinking that this small baby girl of 4 yrs will not interfere with his work and allow him freedom. Within minutes, an acquaintance of the family, who was seated next to the chair which tied down the small baby child, came to the help of this baby child and untied the knot.The baby girl was free. Coming back to my main point of the upgrade released in the skies last night by Uranus, the planet of freedom, I am of the view that every single person incarnate on this planet at this time will be experiencing more freedom in some way or the other. to manifest will be known with a few weeks. Many times while reading messages on face book group and a few other groups like Anything Astrology and My group healing light, I feel overwhelmed with a sense of joy by the fact of being connected to like minded people all over the globe. There are times when messages in groups are really sucking and drain me of energy. But, at times, the messages in the groups are uplifting and inspiring. I am sensing a world wide wave of well being ( All is well even if it is not perfect) swelling with passing of time. There are more and more number of people now becoming positive in their outlook towards life, which was not the case around twenty five or thirty years before. There is a new word which has been inserted in English dictionaries - BENESTROPHE, which means positive things happening on a large scale on the planet. This word was inserted in dictionaries around the year 1995. 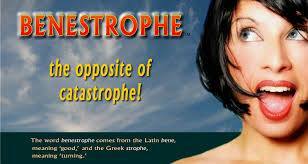 I had the honour of meeting the person who coined this word, in response to an ad by Editors of Oxford Dictionary. He was my Reiki Teacher Mr Ramachandran. There is one more famous author Mr Lee Carol, who has described in detail the phenomena of positive things happening due to changes in vibration of Gaia (Planet Earth). His works can be seen at kryon.com website. There are some startling prophecies that Mr Lee Carol has spoken about in his books. Some of the outstanding and unbelievable prophecies are - Humans will live a much longer life, and average age will be around 300 years or more, within a few generations. The international conflicts, like Palestine and Israel tussle will be resolved in a spirit of give and take and all nations will live a spirit of co-operation. I request friends here to give me feedback with their experiences and observations. I have been reading kryon website (www.kryon.com) since the year 1995. A new post is added to this website every month. And in every post, the human entity bringing in this channeled information, Mr Lee Carroll speaks of earth changes taking place on the planet. What is astonishing to the human mind, bombarded from all over with negative news, is the single message repeatede every month, that is hard to believe. The changes taking place are for the better, and that there is new energy arriving on earth that is going to alter the way we see life and the way we live life. I will be sharing some more views of Kryon that resonate with me. Today, I am sharing here one topic as discussed in the Kryon channel that is very sweet for me, it is the concept of OLD SOUL.
" Those of you who are old souls are connected to others who are old souls. Did you know that? The connection is esoteric and not physical. It's your esoteric family. Listen, there are many old souls in places that are not pristine, and that are not fresh at all. Think of those in the Middle East on either side of the situation. They sit upon land that is always ripe with trouble. They live on layer after layer of horror. As far down as they dig, they find other cities that were conquered and taken with great sorrow and death. What chance do they have when they go into a meditative state? How can they get to a place of even neutrality of consciousness? How can they begin to create a peaceful countenance that comes with a pristine energy? The answer? I'll tell you for the first time: The Field is harmonizing them together. They can go into a meditative state and have an alliance with what is in your area because you are there holding it. They can feel the absolute beauty, freshness and virginity of the land. The connection with Gaia that is in these places can be used by them, and they're not even there! The reason is because those who are in those places are transmitting it to them without even knowing it. This is part of what the old soul does that is new and very esoteric. So if you live in one of these places anywhere on the planet, and are aware of these things, you are being what I call a lighthouse - a transmitter for what you have that they don't have but desperately need. This is important for you to know. In troubled places all over the planet, they are being helped because you live in one of these areas and are holding this energy for them".